Slide design tips: Bullet points kill your message! At the very least, bullets points bore your audience when used ineffectively. Most “Death by PowerPoint” occurs when people put too much text on the slide .. then read it! Bullet points should not be speakers’ notes on the screen. 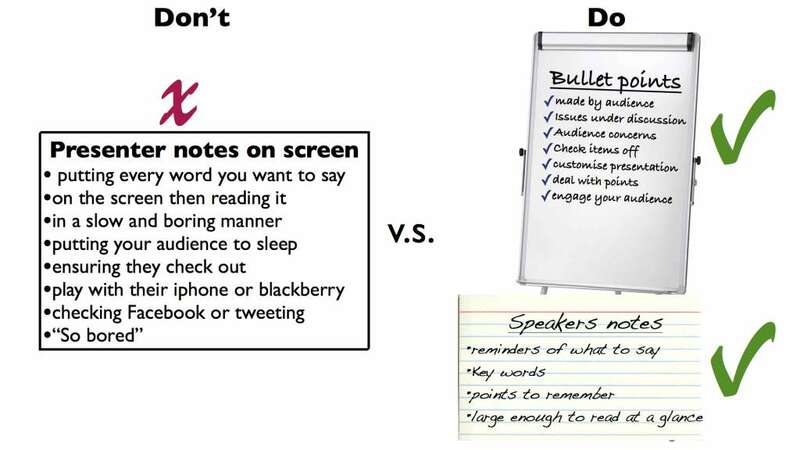 Don’t be lazy; put bullets in the presenter’s notes if you have to have them, not on the screen. PowerPoint is a visual medium meant to enhance your message – not be your message. Audiences get bored when the presenter uses bullets as a prompt or data dump. Use bullet points to engage your audience. Using a flip chart or whiteboard to bullet audience questions, issues or talking points is very effective. Ask the audience for questions they want answered during your presentation, or about their “pain”. Write these Audience created bullets on the flip chart, then tick them off as each point is answered during your presentation. Audiences love bullets – when they have created the content. Use bullets on 6×4 note cards to remind you of key words and the flow of your talk. These are a great backup in case technology fails. Bullet points can be effective in a summary slide, but keep it to a maximum of five points, with a maximum of three words per line. Bullets should be short, not necessarily full sentences. Just the key points to remind the audience of the key elements covered. 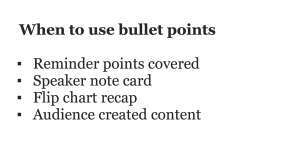 Use bullet points created by the audience or as a reminder in note cards, never on the screen as a cheat.